What Would Chinese Hegemony Look Like? It is certainly not inevitable, but what form would a Sinic Monroe Doctrine take? East Asia is becoming, in the language of international relations theory, “bipolar.” That metaphor, from magnetism, suggests two large states with overlapping spheres of influence competing for regional leadership. The Cold War was a famous global example of bipolarity. Most states in the world tilted toward the United States or the Soviet Union in a worldwide, zero-sum competition. Although analysts have hesitated for many years in applying such strong language to East Asia, this is now increasingly accepted. A lengthy twilight struggle between China and Japan, with U.S. backing, seems in the offing. Until recently, Asia was arguably “multipolar”—there was no one state large enough to dominate and many roughly equal states competed for influence. China’s dramatic rise has unbalanced that rough equity. China is now the world’s second largest GDP. Although its growth is slowing, it is still expanding at triple the rate of the U.S. economy and six times the rate of Japan’s. By 2020 China is predicted to be the world’s largest economy. Its population, 1.35 billion, is enormous. One in seven persons on the planet is Chinese. Were China’s GDP per capita to ever reach Japanese or American levels, its total GDP would match that of entire planet today. These heady numbers almost certainly inspire images of national glory or a return to the “middle kingdom,” in Beijing. They help account for China’s increasingly tough claims in the East and South China Seas. Until recently, China pursued a “peaceful rise” strategy, one of accommodation and mutual adjustment. This approach sought to forestall an anti-Chinese encircling coalition. China’s rapid growth unnerves many states on its perimeter, from India, east to Vietnam, Indonesia and Australia, north to Taiwan, Japan, and Russia. Were these states to align, they might contain China in the same way the Japan, China, and NATO all worked to contain the U.S.SR. The peaceful rise seemed to work, especially in southeast Asia, where Chinese generosity has successfully blocked a united ASEAN position on South China Sea issues. 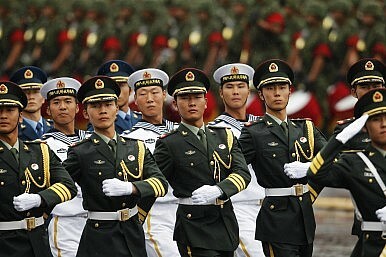 Since 2009 however, China has increasingly resorted to bullying and threats. The 2008 Olympics appears to have been read in Beijing as a sign of China’s newfound might and sway. In the South China Sea it has pushed a very expansive definition of its maritime zone of control, and it recently faced down the Philippines in a dispute over the Scarborough Shoal in that sea. Indeed, one possible explanation for China’s expansion of its air defense identification zone (ADIZ) in the East China Sea is that a hard line seems to be working in the South China Sea. But China’s northeast Asian neighbors are far stronger and more capable than its southeast Asian ones. Most observers expect Japan, South Korea and the U.S. to push back, as indeed they have. The U.S. flew bombers through the new ADIZ without warning, and both Japanese and South Korean civilian airlines have been instructed by their respective governments not to comply. All this then sets up a bipolar contest between China and Japan, in the context of China’s rapid rise toward regional dominance. A common theme in the literature on China’s rise is its apparent inevitability. Westerners particularly tend to get carried away with book-titles such as Eclipse (of the U.S. by China), When China Rules the World, or China’s New Empire. History is indeed filled with the rise to dominance of powerful states. China and Japan both sought in the past to dominate Asia. Various European states including the U.S.SR, Germany, and France did the same. But frequently these would-be hegemons collided with a counter-hegemonic coalition of states unwilling to be manipulated or conquered. Occasionally the hegemonic aspirant may win; Europe under Rome was “unipolar,” as was feudal Asia now-and-again under the strongest Chinese dynasties. But there is nothing inevitable about this. Hegemonic contenders as various as Napoleon or Imperial Japan have been defeated. To be fair, it is not clear yet if indeed China seeks regional hegemony. But there is a growing consensus among American and Japanese analysts that this is indeed the case. By Chinese hegemony in Asia we broadly mean something akin to the United States’ position in Latin America. We do not mean actual conquest. Almost no one believes China intends to annex even its weakest neighbors like Cambodia or North Korea. Rather, analysts expect a zone of super-ordinate influence over neighbors. – foreign policies from China’s neighbors broadly in sync with its own. This is not going to happen soon of course. This is a project for the next several decades, just as U.S. power over Latin America came slowly through the nineteenth century. But such goals would broadly fit with what we have seen in the behavior of previous hegemons, including Imperial Japan and China, Rome, the British Empire, the U.S. in Latin America, and various German plans for Eastern Europe in the first half of the twentieth century. The era of U.S. preponderance in Asia is coming to an end. Why Diplomatic Allies Matter to TaiwanFinding Allies for ChinaCan China Legitimate Its Would-Be Hegemony in Asia?Time for US and China to Establish Maritime Rules of the RoadIs the China-South Korea Honeymoon Over?